McCarthy's Lodge Bar & Guesthouse, Quay St, Westport,County Mayo, Ireland. 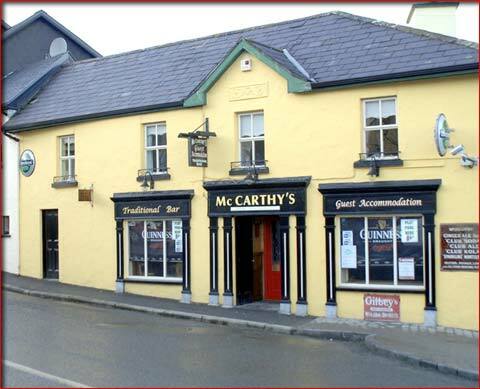 McCarthy's Bar & Guesthouse is a family-owned traditional pub and newly built modern Guesthouse owned and run by Michael & Geraldine Foy and centrally located in Westport town. Westport is the 3rd largest town in Mayo and very popular with tourists as an ideal base to explore Connemara, Achill Island and Clew Bay. All rooms are spacious and have en-suite, TV, orthopaedic beds, Guest Lounge and tea/coffee making facilities. Breakfast is a full Irish breakfast with vegetarians catered for. McCarthy's is family friendly, with baby sitting service & cot also available. Limited car parking and secure lock-up garage for motorcycles. Within easy driving distance are Knock Shrine, Foxford Woollen Mills, Ballintubber Abbey, where the 'rich & famous' - and not so famous - get married! McCarthys can also offer self-catering (rental) accommodation in 2 modern apartments close to the B&B. McCarthys supply a reliable taxi service and can arrange pick-ups from your arrival point - bus, train or airport. Transport to and from your collection point/activity can also be arranged.